The Google-owned computer algorithm AlphaGo is retiring from playing humans in the ancient Chinese game of Go after roundly defeating the world's top player this week, its developer said Saturday. 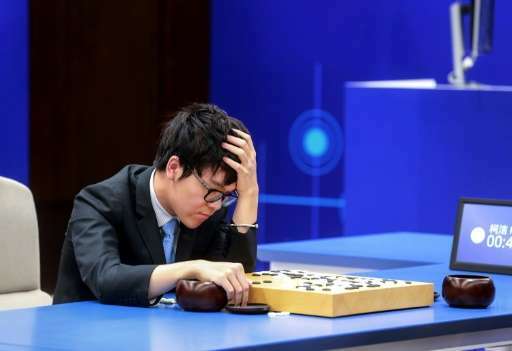 AlphaGo defeated brash 19-year-old world number one Ke Jie of China on Saturday to sweep a three-game series that was closely watched as a measure of how far artificial intelligence (AI) has come. AlphaGo last year become the first computer programme to beat an elite player in a full Go match, and its successes have been hailed as groundbreaking due to the game's complexity. Go has an incomputable number of moves, putting a premium on human-like "intuition" and strategy. But this week's contests in the eastern Chinese city of Wuzhen were its last, said DeepMind Technologies, the London-based AI company that developed AlphaGo and which Google acquired in 2014. In a blog post, DeepMind founder Demis Hassabis said AlphaGo's developers will turn to "the next set of grand challenges, developing advanced general algorithms that could one day help scientists as they tackle some of our most complex problems". These could include "finding new cures for diseases, dramatically reducing energy consumption, or inventing revolutionary new materials," he said. "If AI systems prove they are able to unearth significant new knowledge and strategies in these domains too, the breakthroughs could be truly remarkable. We can't wait to see what comes next." Go involves two players laying black and white stones on a grid, trying to capture the most territory. Invented nearly 3,000 years ago in China, it is played worldwide but most popular in East Asia. Top players have been mesmerised by AlphaGo, describing its play as groundbreaking and opening up new ways of approaching the game. Likewise, AlphaGo's feats have fuelled visions of AI that can not only perform pre-programmed tasks, but help humanity look at complex scientific, technical and medical mysteries in new ways. This week's matches received considerable build-up in China, where it is popular. But Chinese authorities abruptly banned live coverage before the first match on Tuesday, prompting anger and scorn on Chinese social media. The ban was not explained, but quickly fueled speculation that it was linked to Google's tense history with Beijing. "Go has an incomputable number of moves"
I pointed out that this is ignorant garbage when it was stated in an earlier article, and it is stubbornly ignorant garbage now. A go player has at most as many possible choices as the number of empty intersections on the board. This is eminently computable. Um , no. Nick is right. It's not endless. It's large, but large is still finite. Clearly the author was trying to get across the sheer magnitude of possible games, but it was still inappropriate hyperbole.